Ellipse perfect vector beams in focal plane, generated by superposition of two orthogonally polarized (left and right handed circular) component ellipse perfect vortex beams with opposite phase topological charges. The regulating of local polarization state of an optical beam has become an interesting and hot topic in optical complex beam shaping. Perfect vector beams (PVBs) with inhomogeneous polarization distribution and tunable beam dimensions have shown great potential in a variety of applications including optical micro-particle manipulation, super-resolution imaging and light-matter interactions. Popular vector beam generation systems are based on the employment of spatial light modulator (SLM) loaded with a designed computer-generated hologram (CGH), but the generated vector beams are usually limited to fixed mode of ring-shaped structures, and the systems are also facing low efficiency of light utilization. 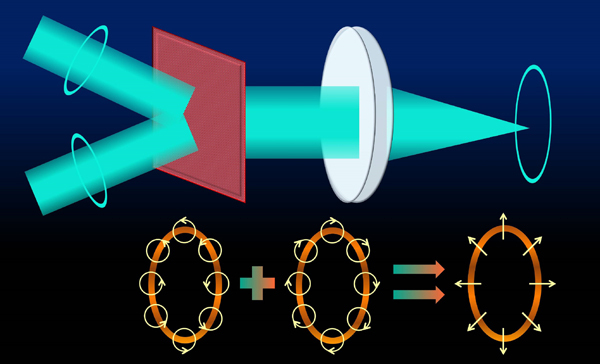 The groups led by Dr. Chenliang Chang from School of Physics and Technology, Nanjing Normal University, and Prof. Jianping Ding from School of Physics, Nanjing University jointly carried out a research of generating ellipse shaped perfect vector beams in a high efficient way. More diverse modes of PVBs are extended from ring to different ellipse structures, based on the modulation of specifically designed hologram calculated by using an advanced holographic beam shaping algorithm. The related work is published in Photonics Research, Volume 6, Issue 12, 2018 (Lin Li, et al., High efficiency generation of tunable ellipse perfect vector beams). The key to generate different ellipse structured PVBs is the algorithm of the phase-only hologram. The algorithm is a combination of inverse diffraction calculation and iterative scheme. The complex field of the hologram plane is obtained by accumulating discrete points of ellipse curve. After continuous iterations, a phase-only profile is finished by calculation under given constraint conditions. The optical implementation is based on the superposition of two orthogonal polarized component beams via an optical filtering system. Moreover, simultaneous generation of multiple ellipse structured PVBs in both of two-dimensional and three-dimensional focal regions are also achieved. Dr. Chenliang Chang and Prof. Jianping Ding both believe that this work has important theoretical and practical significance for generating diversely extended modes of PVBs. They also believe that this work will provide an effective solution to increase the light efficiency in vector beam generation system, by concentrating on the improvement and optimization of hologram algorithm. The further work will focus on the PVB generation of more diverse types such as square, quatrefoil or Archimedean spirals based on the proposed algorithm.